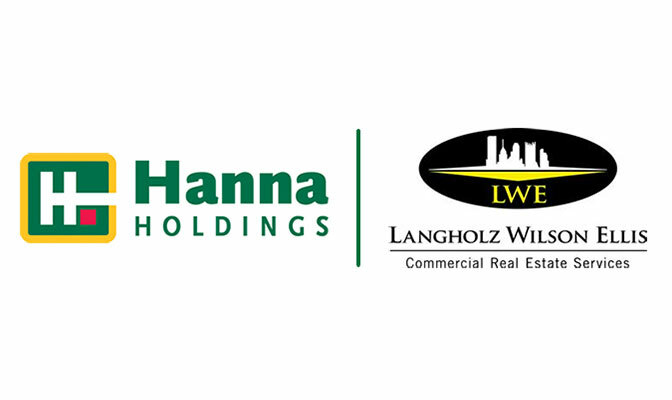 Pittsburgh, PA (December 19, 2014) – Howard W. “Hoddy” Hanna, III, chairman and CEO of Hanna Holdings, Inc. today announced a merger between Howard Hanna Commercial and Langholz Wilson Ellis, Inc., one of the leading Western PA commercial real estate brokerage firms. The merged company, a subsidiary of Hanna Holdings, Inc., will be known as Hanna Langholz Wilson Ellis. Hanna Holdings, Inc. was founded in 1957 by Howard W. Hanna, Jr. and today is the 4th largest full-service real estate company in the United States with 170 offices and 6,500 sales associates and staff across the eight states of PA, OH,VA, MI, NY, WV, NC and MD. Hanna Holdings is privately owned and operated by the Hanna family. After the merger, Hanna Holdings’ gross sales and leasing will eclipse $9 billion and will manage over 3 million square feet of retail, office, and industrial space. While headquartered in Pittsburgh, Hanna Holdings has been building a commercial real estate powerhouse in Cleveland with the acquisition of the Chartwell Group in September 2013 and the merger with 75-year-old Cleveland firm Ostendorf-Morris in June of this year. This combined group with their accomplished agents and staff has become one of the largest commercial real estate brokerage firms in Northeast Ohio. Langholz Wilson & Associates, Inc. was founded in 1990 when partners Kevin Langholz and Gary Wilson acquired industrial real estate brokerage firm Bill Green & Company, established in 1968. In 2005, Langholz Wilson & Associates merged with Ellis Real Estate Company and welcomed J. Keefe Ellis as a principal. By coincidence, Kevin Langholz, Gary Wilson and J. Keefe Ellis, with the Hanna family, are third generation real estate professionals, each having followed their respective grandfathers into the business. In 2010, Langholz Wilson Ellis welcomed Matthew Virgin as a principal in the firm. Since its inception, Langholz Wilson Ellis has assisted its clients on such notable projects in the greater Pittsburgh area as PNC Park, Heinz Field, The Waterfront retail development in Homestead, Three PNC Plaza including the Fairmont Hotel, Shannon Hall, the Art Institute of Pittsburgh’s downtown student housing complex, and more recently the Consol Energy Center, the new PNC Headquarters, and the $125 million apartment and hotel development in Oakland on the site of the former Allegheny County Health Department site. “We have known the principals of Langholz Wilson Ellis both socially and professionally for 30 years. We believe the integrity, culture and valued quality services to our clients are similar in philosophy and reality,” noted Hanna. J. Keefe Ellis will become Managing Director of the combined firms. Ellis stated that the merged company is in search of a new Downtown office location and looks forward to a spring 2015 occupancy within downtown Pittsburgh combining Langholz Wilson Ellis’ brokers and staff presently located at 606 Liberty Avenue and Hanna Commercial’s brokers and staff presently located in the Koppers Building at 436 Seventh Avenue. Hanna’s Sr. Vice President, Peter Sukernek, who announced his retirement earlier this year after 31 years with Howard Hanna Commercial, welcomes the transition. “We have always admired and respected the Langholz Wilson Ellis operation and quality of its professionals,” said Sukernek. “Both of our firms have enjoyed a stellar reputation in this industry, focused on performance with integrity and infused with an entrepreneurial spirit,” said Gary Wilson of Langholz Wilson Ellis. “The combination of Langholz Wilson Ellis’ proven expertise in commercial real estate and Hanna’s vast resources will prove to be the cornerstone for exponential growth of the commercial real estate platform within the Hanna organization. “We are extremely excited about this great opportunity to merge such fabulous people and firms,” added Hanna.